Want to become more familiar with the nine practices of Jesus that can help us relate with people in a way that is always good news? Q Place is excited to announce that The 9 Arts of Spiritual Conversations published by Tyndale House Publishers and co-authored by John Crilly and me, will be available through retailers everywhere starting May 1st. In simple and profound ways, I am confident that as you read the pages of this book, you’ll catch the vision for a more natural relational approach to pointing people to Jesus. 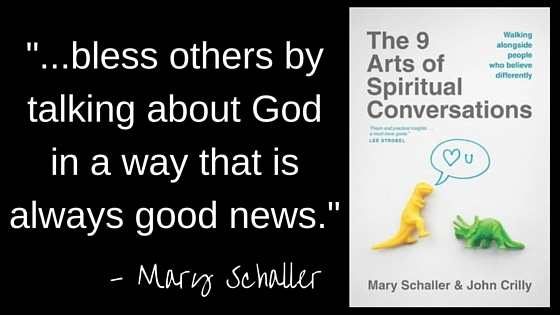 For a gift of any amount, we are also happy to send you an advance copy of The 9 Arts of Spiritual Conversations so you can read and share it with someone you know. I’m excited to share my opening story from the book right here—and it’s my prayer that your life and the lives of those around you will be changed as you walk the way of Jesus. My sister Terry had a window seat in the second-to-last row of a full plane. A young man in his early twenties occupied the coach seat next to her. He was nicely dressed and had gotten out a Bible to read when he sat down. Curious, she asked if he was attending a Bible or divinity school. No, he said, he worked in a sawmill, but he was very involved in his church and loved the Bible. He said he read it a lot. Shocked by the question but trying to assume this discussion was headed in a normal direction, she said she did pray, but typically not with that kind of passion. “If you are not praying ‘right’ like that, God doesn’t hear,” the man exclaimed, raising his voice and spitting out the words with a mixture of excitement and judgment. If she didn’t “pray right,” he said, she wasn’t saved and would go to hell when she died. The plane was just taking off, and he was shouting all of this above the engine noise. “What have I unleashed?” she thought, feeling trapped in the far back of the plane. The young man started leafing through his Bible, referencing passages that reinforced his claims. She couldn’t get a word in edgewise for the next twenty minutes as he zealously justified his position on prayer. Finally, when Terry could no longer stand the lecture, she held up her hand and said, “STOP! Don’t tell me what to believe, and don’t judge me! He’s my God too. I believe only God can judge people.” To her astonishment, the man immediately stopped his discourse, closed his book, bent over the tray table, and started to weep. After about an hour, he finally sat up. Terry didn’t want to look at him; she was afraid he might start yelling again or even pull out a weapon. She thought it best not to make eye contact and pretended to ignore him for the rest of the trip, silently praying for him and for God’s protection. It seemed like the flight would last forever. When they were finally exiting the plane, the young man helped her get her bag down and said he was sorry that she didn’t see things the same way he did. It didn’t feel like an authentic apology to Terry, but rather a halfhearted effort to make peace. She was just happy to be free of him. Beyond the misguided theology about prayer, this poor young man somehow thought that his aggressive approach of intimidation and Scripture quotations would persuade my sister to believe like he did. I am not sure who should be pitied more in this situation—my sister or him. Both were a little spiritually disoriented by the experience. Both walked away wounded from the encounter. Both would classify the interaction as anything but good news. Sadly, we all know this is not an isolated incident. We’ve all heard or read stories like this from unsuspecting “victims” of Christ-followers who wanted to share the good news but lacked the sensitivity or timing to effectively represent Jesus…. We are intimately linked in this harvest work.